Having fled a difficult home life, Civil War nurse Abigail Stuart feels like her only friend in the world is sweet but gravely wounded patient Jeremiah Calhoun. Fearing he won’t survive, the Confederate soldier’s last wish is that Abigail look after his sickly sister at home. Marry him, return to his horse farm, and it’ll be hers. I’ve mentioned this before, but I love reading Christian historical fiction novels during the wintertime. Maybe because they’re perfect for reading during Christmas break: quick reads with happy endings and heartfelt morals. 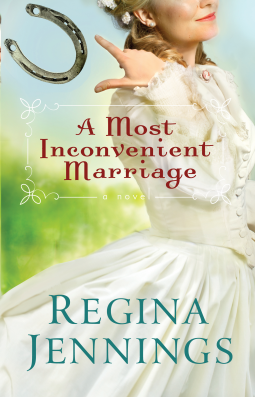 A Most Inconvenient Marriage was a great choice for me to read last weekend. I was happily surprised at how much I enjoyed this novel because sometimes this genre can be a bit cheesy and unrealistic. However, Regina Jennings does a fantastic job at making her characters very real. They are not perfect; they have tempers and make poor choices and have a hard time seeing what’s right in front of them. But they are also entertaining, and there were several scenes in this book that had me laughing out loud or covering my face out of embarrassment for the characters (like I said, they sometimes make poor, but funny choices). This novel takes place at the end of the Civil War. Abigail was a nurse serving the Union Army, and her patient Jeremiah Calhoun, was a wounded Confederate Soldier, who was forced to join the war not to defend slavery but to protect his family and property. The central conflict in this novel occurs when Jeremiah suddenly shows up alive and slightly crippled, leaving a mystery surrounding the identity of Abigail’s deceased patient. This novel deals with themes of prejudice and forgiveness, themes that can be applied to current events happening in our society today. One of my favorite values I took away from this novel is that, as a community, everybody relies on everybody else. Sometimes they don’t have a choice about being dependent on others, but everyone has a choice on how they treat their neighbors. The characters in A Most Inconvenient Marriage have to overcome their bitterness, their prejudices, and their pride in order to solve the conflicts that are assaulting their community. I love seeing characters overcome their faults as a collective community rather than autonomous individuals. …you enjoy historical fiction with religious references. …you’re intrigued by issues of prejudices and civil unrest. …you’re drawn to books about characters with real faults who make realistic mistakes. …you’re a romantic at heart (let’s face it, this book is mainly a romance)! I’ve previously only read a novella by Regina Jennings (An Unforeseen Match, one of four stories in A Match Made in Texas), but I really enjoyed this full length novel a lot more, perhaps because she was able to develop her characters more deeply. This novel takes place over a span of several months, so no one falls in love within a few days or weeks even, and the characters take a realistically long time to overcome their faults. As I’ve often felt with other historical romances, I expected this book to be filled with cheesy clichés, but it wasn’t. « From the Fifteenth District by Mavis Gallant – Blog Tour & Giveaway! This sounds quite good! Adding to my TBR list.